Rural house in Tombeboeuf,. Independent house capacity up to 13 people. Come taste the charm of our quiet half-timbered house, located in the countryside Lot-et-Garonne at the edge of the Haut Agenais and Perigord and visit our castles, our country houses and enjoy our gastronomy (foies gras ...) and our wines (Duras, Buzet ...). Our cottage can accommodate 11 people and Chalet in Annex 2, fully equipped. Total capacity 13 people. Large terrace of 45 m² relaxing and ideal for relaxation. Wooden pool above ground 6. 3. 80 x 70 x 1. 10, panoramic view, relaxation area. Approved cottage CLEVACANCES: 3 keys - label: environment, fishing and smiling Lot-et-Garonne. Bathroom with hydro-massage shower to enjoy or discover the benefits of water. In off season, our prices are variable and adapted to the number of occupants. From our cottage, you can go hiking or V. T.T, otherwise 2 km. Fishing, golf, tennis or horseback riding. You can browse the Lot Aiguillon in Cahors and on the baize and side channel of the Garonne. Our region has a great culinary asset with its foie gras and wines can be enjoyed in the cellars of Buzet, Duras, Bergerac or Saint Emilon. Visits castles and Perigord Agen houses are needed and the caves. End of stay cleaning fee. The cottage is open all year and our prices are decreasing according to the seasons and the number of people (except in very high season). Our prices are included, water and electricity. Possibility of renting sheets and towels. IN WINTER A SUPPLEMENT OF 5 E / D YOU WILL ASK FOR PARTICIPATION IN THE HEATING. Accueil chaleureux, maison spacieuse et agréable et surtout cadre magnifique! Nous avons passé un long week-end formidable avec toute notre famille réunie, et les enfants heureux qui pouvaient courir dans l'herbe. Nous avons passé un formidable séjour dans ce gîte très spacieux, très bien entretenu, authentique avec ses colombages et sa grande table ronde conviviale. La propriétaire Dany est très accueillante, toujours à l'écoute de ces hôtes et fait des oeufs au lait merveilleux. le jardin est fleuri avec beaucoup de goût. Nous avons fait plusieurs randonnées bien balisées autour du gîte qui est situé au coeur de la verdoyante campagne lot-et-garonnaise. Un endroit idéal pour se ressourcer. Je le recommande et je pense d'ailleurs que je reviendrai y séjourner. 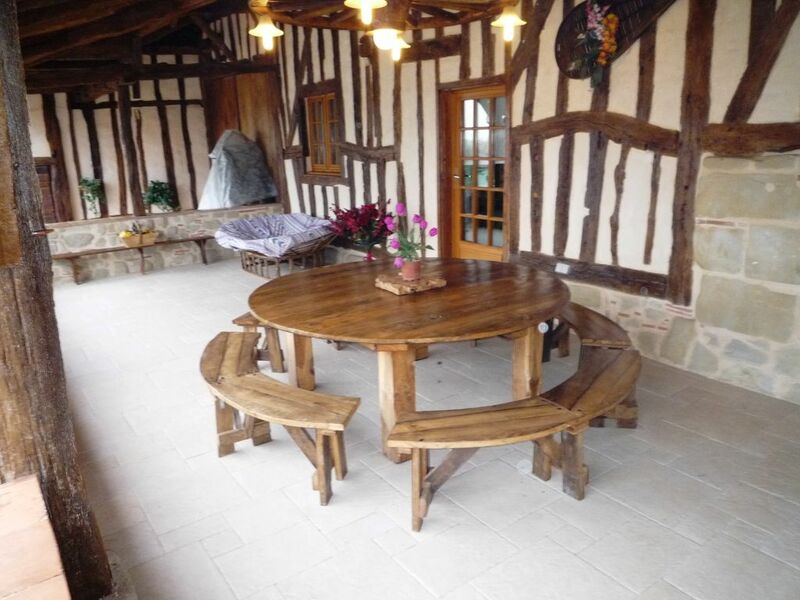 Restored house with great charm, typical of the Lot-et-Garonne, with its timber and its rustic furniture, provides a nice private garden with a private covered above-ground pool. A small annex cottage will accommodate 2 more people. Tombebeoeuf and golf are just a few kilometers, and many other tourist attractions of the Lot-et-Garonne. Area: 148m². 4 bedrooms: 1x160,2x140,1x120,2x90. Loc. linens. 2 SDE. 2 toilets. Sofa bed for 2 pers. in the annex with shower room and WC. Kitchen / living room: Mwave, Lvaisselle, llinge. Fireplace. Salon. Sofa convert, TV. Covered terrace of 45 sqm. Private land. Garden furniture. Barbecues. Bowling green. Parking. Private wood above ground pool with removable covered shelter. (6,80m x 3,70m). Modular week tariff according to the number of occupants. possibilite de location de linge de toilette, de draps,linge de cuisine Nettoyage 80 euro Pour une nuitée le prix est de 255 euros, ménage inclus. Pour deux nuitées le prix est de 333 euros, ménage pas inclus. Pour trois nuitées le prix est de 374 euros ménage pas inclus. Une caution vous sera demandé a votre arrivée Le prix du chauffage l'hiver est de 5 € par nuit.